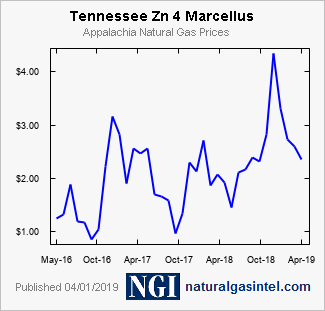 Tennessee Zn 4 Marcellus Price Data? Daily, Weekly and Bidweek Prices are in U.S.$/MMBtu except for locations in the Canada section which are in Cdn$/GJ. For more information, please seeNGI's Price Methodology. NGI's Natural Gas Forward Basis Prices are expressed in U.S.$/MMBtu and based on indicative data obtained from traders, exchanges and deals provided by energy companies. "Fixed Price" represent the forward prices of natural gas delivered for each reference period at the various locations/hubs. "Basis Price" represent the differential, for each reference period, between the Henry Hub and various locations/hubs. The Summer and Winter prices are simple averages of Apr-Oct (7 months) and Nov-Mar (5 months) respectively. "Bal Smr" and "Bal Wtr" prices represent simple averages of the remaining months in those seasonal strips (after at least one month has passed). For daily updates of these natural gas forward basis data in monthly bullets going out 5 years, contact sales at info@natgasintel.com.